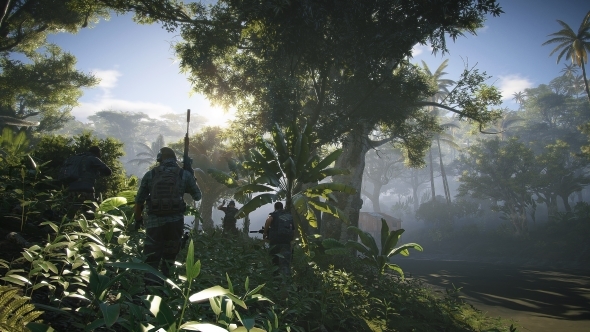 Ubisoft have announced their third free update to Ghost Recon Wildlands, named Extended Ops, adds new extraction maps, icon skins and a new PvP mode. The update will also introduce Battle Crates “designed to offer you an additional and accessible way to complete your cosmetic customization experience”. It’s dangerous to go alone. Check out our list of the best co-op games. Battle Crates can be bought from the Ghost Recon Wildlands store for 400 store credits, with each crate containing three items the player does not already own. However, store credits can only be bought with real-life money. Luckily, Ubisoft have assured players the crates will have no impact on gameplay progression so those who don’t buy them will not be missing out hugely. “Throughout the development of the Battle Crates, we made sure the implementation is fair in terms of the items given to players, while also ensuring that they have zero impact on gameplay and player’s progression,” Ubisoft wrote in a Battle Crates F.A.Q. Battle Crates are available in campaign and co-op modes, as well as in Ghost War mode. Campaign and co-op crates are called Spec Ops Crates and contain epic weapons, exotic weapons, vehicles and cosmetic items. Ghost War Crates, available in Ghost War mode, contain exotic weapons, customisation items and an a new line of skins, called Icon skins, which include Rainbow Six Siege character costumes. However, The exotic weapons available are merely “re-skinned versions of weapons already available in the game” and have no effect on weapon stats. All items available in the crates are also available to buy from the store directly, however the Icon skins are exclusive to Ghost War Crates and cannot be purchased. Ubisoft have also promised crates will produce no duplicates. In addition to Battle Crates, the Extended Ops patch introduces the Extraction PvP mode, which sees players trying to defend or extract a hostage from the enemy team. Extraction mode will be playable on both the Garage and Institute map, with more maps promised in the next update. You can check out the full list of patch notes for Extended Ops here.